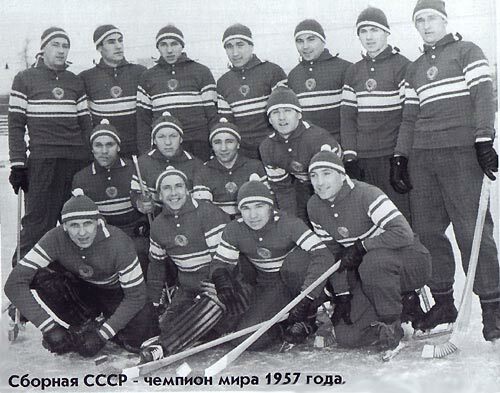 The 1957 Bandy World Championship was contested among three men's bandy playing nations and was the first ever Bandy World Championship. Norway declined to take part due to the Soviet invasion of Hungary the year before. The championship was played in Finland from 28 February to 3 March 1957, as part of the fifty year anniversary celebrations for the Ball Association of Finland, which at the time was the governing body for bandy in Finland. The tournament was officially opened by President of the republic Urho Kekkonen. All games, which were only three, were played at the Helsinki Olympic Stadium. The Soviet Union became champions. ^ Arne Argus (2003). Mästarglans kring bandy-VM (in Swedish). Svenska bandyförbundet (Swedish Bandy Association). p. 2.